Alongside the pedals and the saddle, the handlebars are one of the only contact points a cyclist has with their bike, so they're of high importance. They provide a solid grip on the handlebars, protect hands from obstacles, sun and from falls, and are also very breathable. Partially equipped with highly effective gel inserts they also help to dampen vibrations and prevent fatigue. Brands like Pearl Izumi, Roeckl, Endura, POC and Giro offer a wide range of bicycle gloves. Cycling gloves for use on road bikes are made of highly functional materials to ensure breathability at the highest level. Finally, the skin is not softened by sweat. In the summer half-finger models show their worth, when the temperatures mean that you don't need regular gloves. The focus here is on good ventilation and superb dampening to counteract vibrations that are transmitted through the hard fork. When it gets colder, then fingerless gloves start to reach their limits. In autumn, spring and winter, the models need to be wind-resistant, water repellent and lined to insulate against the cold. 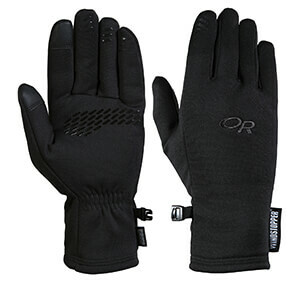 While the temperature range should still be considered, the protective function of gloves is more important for mountain biking. Here again depending on the use, materials like Windstopper or Gore-Tex are used, supplemented by protective padding and armor sections. In the forest, branches often whip across the path and stones fly through the air, so you need well-padded gloves. So for downhill cycling, there are more serious models with plastic and carbon panels to protect the most sensitive joints. As the handlebar shakes and wobbles along the trail, the gloves need to provide a high level of grip. They belong to every cyclist's basic inventory!